You are here: Home / Compresssion Stockings / How Tight Is Too Tight When Wearing Compression Stockings? One of the chief complaints of people wearing compression stockings is that they find them to be too tight, sometimes to the point of being uncomfortable or even intolerable. This frequently voiced grievance about compression hose or stockings may or may not be valid in each case and therefore demands further investigation. First of all, it should be pointed out that compression stockings not being tight would be a contradiction in itself, because as the name says compression implies that pressure is applied to something. Logic would dictate that the result would be a feeling of squeezing and tightness. Consequently, compression stockings by their very design and nature must be tight. This obviously summons some closely related questions on this subject matter. How tight should compression stockings be? How tight is too tight when it comes to compression hosiery? In the following, we will try to shed some light on these important concerns. Keep in mind that compression stockings are designed and manufactured to have “graduated compression”. This means that they intentionally feel the tightest at the ankles where the compression is the highest. As you move up the leg of the compression stockings or pantyhose the tightness gradually lessens because the compression also gradually decreases the higher you go. It is therefore completely normal that compression hosiery feels tighter in the ankle and calf area than it does in the thighs. The tightness of compression stockings can be particularly challenging and frustrating while trying to put them on or taking them off. To make this process less exhausting, you absolutely must take the necessary time and patience to don and doff compression stockings or pantyhose. You will need to ensure that they are properly situated without wrinkles or folds that could pinch, cause pain or even interfere with proper blood circulation. Last not least, trying to rush things by pulling on the compression stockings could also quickly ruin some potentially expensive legwear. To make life with compression stockings a little easier there are a number of ingeniously designed donning and doffing devices available that can be of great help in this strenuous process. They may prove especially beneficial for individuals with limited hand strength or arthritic conditions. How tight should compression stockings fit? This is a difficult question to answer because compression stockings of different compression levels obviously also have varying degrees of tightness. In addition, it depends on the individual wearing them. People have different tolerance levels for things such as pain or temperature, for example. In a similar way, this also applies to what a person perceives as too tight and what actually is too tight from a medical point of view. In some cases, if compression stockings are too tight, an age related condition known as Senile Purpura can cause small blood vessels in the legs to break and cause bleeding under the skin. This can usually be remedied by reevaluating the patient and changing the size and/or compression level of the stockings. What can be done if compression stockings feel too tight? If you feel your compression stockings are too tight, the first course of action should be to make sure they are properly sized for your legs and feet. It is of utmost importance that compression stockings are sized correctly to get the best results while wearing them. If you have previously taken your measurements for compression stockings yourself we suggest you have them checked by a professionally trained fitter of compression stockings. You can call your nearest medical supply store to find a certified fitter or contact your physician or specialist office to assist you in finding one. If you have been measured by a professional fitter have your measurements re-checked regardless (even they can occasionally make a measuring mistake). Once you have located a certified fitter for compression stockings, make an early morning appointment to have yourself measured before your legs have a chance to swell up. If you are new to wearing compression stockings it may be a good idea in general to start out with a lower compression and gradually build your comfort level (even just wearing them initially for a few hours at a time) to the compression your physician has recommended for your condition. 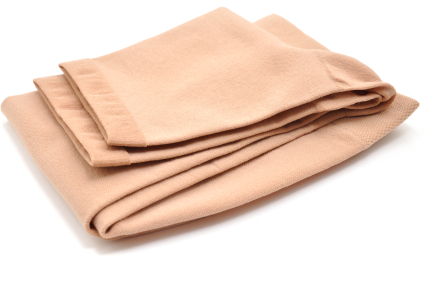 The cold hard truth is that in order to get the benefits compression stockings can provide you need to actually wear them. If you are certain that you have the correct size and you still cannot tolerate the tightness of the compression level you are wearing you should talk to your medical care provider to see if you could drop your compression stockings to a lower compression level. Common sense would dictate that it is still better to wear compression hosiery at a lower compression level than not at all. I was originally searching because while the compression on my calves actually is nice, my outer toes feel weird. A bit numb, a bit hypersensitive. No idea if I should be using them until a doctor prescribes them. I like the hug on my lower legs, not so sure about the weirdness in the outer three toes. Many thanks for your informative and sensible advice. I had sclerotherapy performed on both legs in 2009 and my Doctor advised me to wear graduated support thigh high stockings, compression level 20-30 mgHg. I started with Jobst thigh high stockings for men, but found them to be very uncomfortable to wear. I switched to Jobst women’s pantyhose in the same compression level and they were so much more comfortable to wear. My doctor was surprised that I chose to wear ladies pantyhose but he actually thought they were better for me, No argument from me! I agree with you that if your compression stockings are causing pain or making you pinch your skin, that they are too tight. My girlfriend is all about the compression socks and apparently, they make her feel slimmer. Thank you for sharing your advice on compression and when to know that it is becoming a burden and not a blessing. I must say you have high-quality articles here. I have been wearing compression stockings for years and I have tried lots of different ones. If you could get custom ones made then you would usually get the best results, but if the standard sizes suit you, there is no need for them, and usually they do the job. They are hard to put on and most people probably give up on them for this reason, but it’s important to try variations to find the right type. I have found flat knit ones to be easier to pull on because they don’t crease up as much, and they are thicker than the circular knit ones which can cause problems when you wear shoes because they don’t provide much protection from the interior of shoes or boots. If you have feet that are susceptible to skin damage, then flat knits are better, but only if they are made to the correct measurements. I find the flat knits to be harder to take off. One technique of taking them off is to pull them halfway down (which should be easy since they are tightest at the ankle, and then locking it down by stepping on it with your other foot and lift the leg with the stocking on. They should easily peel off and your legs are doing all the hard work and you do not have to bend or pull – if you do it right, there should be no problem. When putting them on, the important thing is to take your time. Make the time. If you are in a hurry, you will either get them on wrong or you may pull them on too quickly and cause damage to your skin. The shearing injuries have a cumulative effect over several days so it is important to take your time and pull them on gently and slowly. If you pull them at the wrong angle and if they feel like they are causing damage then better to discontinue use and get new measurements or try a different fabric or type. If the stocking have been correctly measured then they should actually feel good, as if something is breathing life into your legs. When on, they should feel good, and if they don’t something is wrong and you have to work it out. I think this guide is good but for people with deep venous insufficiency, and with stasis dermatitis, even tiny mistakes in application can have significant consequences and injuries that will ulcerate and take months to heal. I know this from experience, the important thing to remember is that if your skin has already been damaged by the venous insufficiency then even if the condition is controlled by the stocking, nothing could be done about the skin that has become vulnerable to ulceration, and poorly fitting stocking will do nothing good for your skin and cause more ulcers. Although there are professionals who can do the job, pay attention to what they are doing and if they are not taking the measurements properly let them know. A sloppy job on their part will lead to months of anguish. In my case, I only recently realised that the person I trusted to do correct measurements had been doing a poor job and in fact, I have had repeated ulcers that have taken months to heal because of his mistakes. Thanx. for the info. on compression stockings. I was seriously thinking of cutting the top band bcause this is wear the pain comes from. I also have very fat legs, truly. My calves almost have no shape & are about 20 inches around. Ankles are 12″ around. Appreciate this article &the fact that you are still reading &replying to comments! The lymphedema clinic suggested them, so we got a pair. I guess they are better than nothing, but no real compression value. They are more like a pair of Isotoner gloves for your feet. They really don’t get rid of the swelling that is already there, but they might help to keep them from getting worse. I have been consulting with all his doctors about all this, but none of them have any answers. They say I am doing a good job keeping it under control and keep up the good work. That is my problem…It is way to much work. I just want to find someone who can tell me what is causing it. If anybody out there has any suggestions Please Pass it on thru this blog. People with swelling in the toes and feet have given this product great reviews. As always check with your dad’s physician first before trying any products. Thank you Gregory for your fast response…but the toes in those toe socks are not compression toes. The compression starts at the ankle and goes up from there. My dad needs something to compress his toes and his feet…I have his legs under control but his toes and the tops of his feet where his toes meet his foot is where nothing seems to work. I have had him to the lymphodemia clinic, and there toe wrapping does not work either. I just need something with compression in the toes and behind. Maybe you can steer me in the direction of what kind of Dr I can take him to, that can help me find out what is going on. One thing that comes to mind is toe compression socks – read our post http://www.compressionstockingssite.com/toe-compression-socks-whats-the-difference/ for details. Before you try them however make sure to check with your dad’s physician if it is okay to do so. I am looking for something that has compression in the toes and right behind the toes. My dad suddenly started having swelling in his ankles…it then moved into his feet and toes and has progressed up both calfes. It started in march 2015 and I have taken him to every kind of dr and he spent 8 days in the hospital in january 2016. When his legs get real bad he gets real confused and unsteady on his feet. He has seen: lyphodema dr, vascular surgeon, cardiologist, orthopedist, internest, and I could go on. He has had ct scans, ekg’s with and without contrast, ultrasounds of his leg veins, blood work that boggles my mind…Everybody says everything is normal. Nobody Can tell me what is causing the swelling. He is 84 years old but was very active before this started. He wearing something that looks like a pair of gloves that goes over his toes and half way up his foot, but they are pretty much worthless. I then wrap a narrow ace bandage starting just back of the toes up to the top of his foot to try to push the fluid out of his foot. I have compression tubes we got from the lyphodema clinic that I put over his feet and legs and I finish off his legs with velcro calf compression wraps. Most of this works but it is time consuming and not very comfortable for him. The biggest problem are his toes and right behind them. Fluid settles where I can’t get enough compression. I am massaging it out but it just comes back. Are there any products out there that have strong compression for the toes and behind? I am getting desperate for an answer. Great information and very helpful. My 86 year old mother in-law has really bad varicose veins in her calf and from the knee down it hurts her, especially her ankle which swells really bad. I put the compression stockings on her and she pulls them down almost to her ankle. She also has dementia real bad and don’t listen very well to what I tell her. I’ve taken her to the doctor’s three times now and they did an ultrasound to rule out a blood clot, no blood clot. I just took her again on Tuesday and her doctor sent her for blood work and an X-ray of her ankle. Haven’t heard anything from those test yet.I think I’m going to try a lighter compression and see if that works. Thank you for all the information. Thank you for your comment. Correct measuring and sizing for compression stockings are very important indeed. Maybe you should try a different physician or specialist for a second opinion and proper recommendations for what the best compression level, type and sizing of your stockings should be. Best wishes. My doctor did not measure my leg and told me to get medium to firm compression. (Achilles tendon injury.) The medium increasingly hurt throughout the day and when I took them off there was a very deep band mark under my knee that took a day to disappear. I ordered another pair from Amazon, but I don’t think compression is for me. And my quack doctor should have measured and given me more thorough advice. The Compression hose I’ve worn in the past, non of them have worked for me even tho I’ve had my legs measured. Once I finally get them on they feel pretty good to begin with. Then, after a while when I’m walking, the movement of my legs cause them (knee highs) to roll down and began to hurt in the place where its come to stop. In a bit when I have to roll them down to my ankles for relief, they start to hurt there and I just plain take them off. I can’t take that digging into my flesh cause it hurts too bad. I feel such a relief once they are off. Once they end up at my ankles they just have to come off. I would wear them constantly if they stayed up where their suppose to be and not roll down. What should I do, I know I need to wear them? P.S. I’ve got fat legs. My doctor told me to wear compression stockings with no other info. I had no idea that there was so much involved in picking the right type. I am so happy that I found your website because now I know what to do before I buy any. You have answered all the questions that I have. I will continue to check this website periodically for any updates. Thanks so much. Another point worth making is this: if you have been prescribed compression stockings by a doctor for a known condition then you must wear them. I have worn them for twenty years and never hesitated. Sure they are hard to put on and take off (I usually need someone to help me put them on/take them off), but had I not worn them, my condition may have progressed/deteriorated. I can understand that such hosiery can be uncomfortable for many people but one can consider different compression grades, materials or types. Something will surely suit you, and it is important to persevere. I suffer from deep venous insufficiency and was prescribed Class 2 stockings. Those were effective and comgortable. Due to the nature of the condition, I still got foot ulcers from time to time so making lifestyle adjustments was more or less necessary. However, after some time my vascular surgeon thought class 3 stockings may be more effective. To some extent he was right because, although tighter, they did help initially. However, in spite of having regular measurements taken to ensure an accurate fit, the stockings eventually started to cause damage to my skin. This damage was cumulative and over several days or weeks would lead to foot ulceration. Since Class 2 stockings did not cause this problem, I am considering reverting to those to see if they help. I do suspect that the level of compression may be too high and if the class 2’s solve this problem it may be best overall. I do believe that too much compression can be bad because sometimes there is a feeling of way too much pressure on one spot and over time the skin gets damaged so one should aim for the lightest tolerable compression because you do not want to trade problrms – you treat your underlying condition at the expense of damaging your skin. Always get Made To Measure stockings and rnsure the compression is right. A bit of trial and error may be necessary. Be aware that serious complications can happen from a too tight compression stocking. I was having a perfect recovery from a total knee replacement till the hospital put one on. No pain over 4 even during exercise. 7 hours after the stocking was put on my pain suddenly rose to taken. My lower leg was numb and pain was ttravelling up my leg to my upper thigh. I had been active from right after surgery. The hospital is generally good but the nursed did no measurements, just guessed at the size and asked me if it was too tight. Sure it was tight but I knew it was supposed to be, how was I to know what too tight was. It’s been two hours since the took it off and my calf is still numb. Truly great articles on this internet site, appreciate it. Wonderful web site. Thank you for your efforts! This is very informative. When I was first prescribed compression stockings, it was a few months after my DVT & PE, and I was scheduled to fly to Europe shortly thereafter. I was wearing the highest compression level and they were so tight that my feet had turned white. I took them off at my layover stop and never wore them again. After reading this post, I think I will seek a lower compression level and resume wearing the stockings instead of playing Russian roulette with my health. I’ve learned some excellent stuff here. Certainly valuable for revisiting. You have made such a magnificent informative website. I truly appreciate this post. You have made my day! Thanks again.